The home-electronics industry is a greatly competitive one that offers a plethora of products to the merciless scrutiny of the consumer. So how does a company competing in such an industry persuade consumers to purchase their products? By offering excellent performance at affordable prices. This is the philosophy adopted by Polk Audio, and by adhering to it over the years, have transformed their name into one widely recognized for quality and performance. So when I was approached to review a Polk Audio RTi-series home-theater speaker system, I was intrigued to see and hear what they could do. I was sent four RTi A1 bookshelf speakers ($339.95 USD per pair), a CSi A4 center-channel speaker ($279.95 each), and a DSW Pro 400 subwoofer ($449.95), all but one finished in handsome real-wood cherry veneer (the subwoofer is painted black). The RTi A1 is the only speaker I know of that sports real-wood finishes at so low a price. (It’s also available in black ash.) List price for the system, as described, is $1409.80. Underneath that wonderful cherry veneer are five more layers of viscous laminate that comprise the non-rectilinear shape of each speaker. In all five of their RTi A models, Polk employs what they call Damped Asymmetric Hex Laminate Isolation (DAHLI), a cabinet design that reportedly results in a stronger, stiffer, more acoustically inert enclosure. As well, all RTi speakers have gold-plated five-way connection posts spaced far enough apart to make hooking up speaker cables a breeze, regardless of method. The RTi A1 is a magnetically shielded, dual-ported, two-way speaker with a 1” silk/polymer-composite dome tweeter and a 5.25” polymer/mineral-composite mid/woofer. The technologies developed by Polk for the RTi series are many for a speaker at this price. 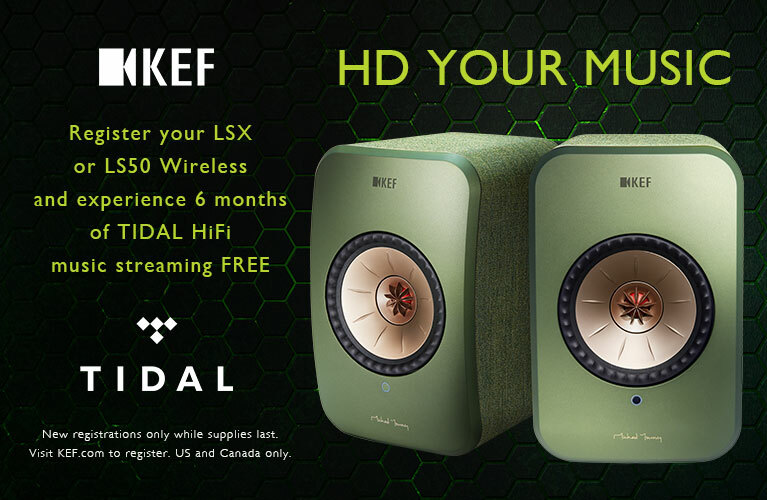 In addition to the DAHLI system mentioned above, Polk Dynamically Balances and Klippel Optimizes their speakers. What this means in English is that, in an effort to reduce or eliminate factors that deleteriously color the sound, they microscopically observe the operation of each component of each speaker. Along with this, Klippel Optimization makes sure the speaker will perform well at both low and high volumes, to offer a balanced yet dynamic performance. Once Polk was satisfied with the driver and cabinet designs, they turned their focus to the ports, in an effort to ensure that the air moving in and out of them did so quietly and smoothly, and that the bass output was maximized with a minimum of distortion. This they accomplished in two ways, first by using a unique rear-firing port that Polk calls the PowerPort -- essentially, a long, flared port with a dispersing cone mounted just past its outer end. This reduces turbulence in the air exiting the port, thereby diminishing noise, or “chuffing,” while providing deeper, cleaner, more authoritative bass. The front port, just below the mid/woofer, uses a technology Polk calls Acoustic Resonance Control (ARC), which takes advantage of the internal resonance created by the driver’s backwave. Polk matches the frequency of this resonance with the front port’s tuning frequency. Because the port’s and the cabinet’s internal resonances are thus the same but out of phase, the peak resonances within the cabinet are canceled, resulting, Polk claims, in a more natural sound, with lower midrange distortion. All of these technologies combine in this little bookshelf -- it measures only 12"H x 7.375"W x 11.5” D -- to help it reach as deep as 60Hz, -3dB, while maintaining an efficiency rating of 89dB. The CSi A4 center-channel speaker, designed to partner the RTi speakers, is, in my opinion, the jewel of the quintet, especially considering its price of $279.95. Measuring a modest 20"W x 6.875"H x 8.75” D, the CSi A4 uses the same 1” silk/polymer-composite dome tweeter as the RTi A1, along with much of the same technology and components, but differs in having two 5.25” drivers. The CSi A4 doesn’t dig quite as deep as the RTi A1 but comes close, with a claimed frequency response of 65Hz-26kHz, -3dB, and the same claimed efficiency of 89dB. The CSi A4 has only one set of speaker terminals on its rear panel, which prevents biwiring, and vents via a single front-firing ARC port. It seemed to work -- the CSi A4 exhibited an almost complete lack of boxiness. Also contributing to that lack of boxiness is the contoured top of the cabinet, whose shape creates an asymmetrical internal space to help eliminate resonances there, but also gives the listener the option of flipping the speaker upside down and placing it on the floor, so that the driver axes point up, toward the listener. Whether placed atop or below my display, voices sounded clear and concise through the CSi A4, with lifelike presence. The off-axis sound, too, was excellent. Keeping in mind that flexibility of setup is key in a system of small bookshelf models such as this, Polk offers three subwoofers that mate well with the RTi series, yet occupy little floor space. Included with the review system was the smallest of the three, the DSW Pro 400 powered subwoofer ($449.95 each), whose digital amplifier, Polk claims, puts out 360W peak to drive its single 8” composite polypropylene cone down to 30Hz, -3dB. Measuring just 14.625"H x 13.75"W x 13.75"D, the DSW Pro 400 takes up less than two cubic feet of space, and can be oriented so that its cone fires either downward or to the front. 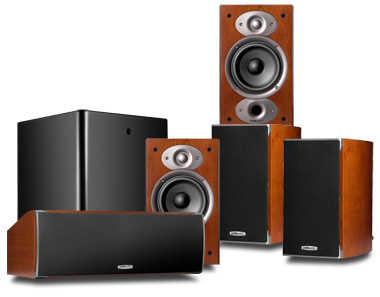 To my disappointment, Polk’s three DSW-series subs don’t share the RTi and CSi series’ high-quality real-wood veneers. Instead, they’re finished in an attractive flat black that’s sure to fit any décor (it can be painted). Under the finish is an extensively braced cabinet of MDF with a slot-loaded port. Around back are two pairs of line-level inputs, an LFE input, a low-pass filter adjustment, an On/Off/Auto switch, and two pairs of five-way binding posts. To control the remaining adjustments and setup options, Polk has included a fantastic remote control, the size of a credit card, that I found so easy and intuitive to use that opening the manual to complete the setup proved unnecessary. Other than basic power and volume control, the remote lets you switch among four phase positions in 90-degree increments, from 0 to 270 degrees. Depending on the size of the room and the sub’s location in it, the DSW Pro 400 offers a choice of four equalization settings: Corner, Cabinet, Mid Wall, or Mid Room. I found this approach refreshingly straightforward and very effective: you simply select the appropriate position, and the DSW Pro 400 optimizes itself with preset slopes to provide the best performance possible from its position. I set up the Polk system in my 13’ x 25’ listening room with the front speakers sitting on a pair of 24”-tall speaker stands, each 1’ from the front wall and from the side of my TV cabinet. The rears were placed on 30” speaker stands about 1’ to the side and behind my couch, and the sub midwall, roughly 2’ from the right front speaker. Power was provided via a Rotel RSX-1058 A/V receiver delivering 75Wpc through River Cable Flexygy 8 speaker cables, and all source material was played by a Denon DVD-5910CI DVD player via River Cable Audioflex Gold Plus analog and HDMI cables. After positioning the DSW Pro 400 subwoofer to fire downward and taking about five seconds to set it up, I toed-in all four RTi A1s about 15 degrees toward my listening position and was ready to go. I was eager to hear if the RTi A1 system’s performance would match its outstanding build quality, and I wasn’t disappointed. One thing I love about small, well-built bookshelf speakers is their uncanny ability to image and “disappear” from room, system, and sound. For the most part, the Polks did just that. When playing chapter 29 of James Cameron’s Aliens, in which the team attempts to draw the aliens toward them by directing them down two corridors, into an ambush of automated machine guns, the RTi A1s did an excellent job of conveying intensity, displaying surprisingly good dynamic range and decent midbass punch for such small speakers. This was evident with each shot the machine guns fired down the corridors, and by the sheer volume of what was going on. The DSW Pro 400 did a great job of conveying impact with each shot, while never making me aware that it was 2’ outside the “circle” described by the five non-sub speakers. Detail from both the RTi A1s and the CSi A4 was clean and well defined yet never brash, as some smaller systems can sound when pushed to higher volumes. When I watched chapter 11 of The Descent, the RTi A1s worked together to convincingly reproduce the aural experience of being in a cave -- I could hear water trickling down walls around and behind me, even though I was much more focused on watching the spelunkers trying to cross the underground crevasse. I was also very pleased with the performance from the center channel with this film’s soundtrack. Most of the characters have thick accents that can be difficult to understand unless heard clearly, especially when they’re talking fast or screaming in fear, yet the CSi A4 did an admirable job of articulating every word. In fact, voices -- quiet or loud, male or female -- were lucid and concise from every source signal I fed the CSi A4. Although the center-channel speaker is timbrally perfectly matched to the RTi A1s, it was so tonally correct that it could easily be used in a system with higher-end speakers. The Polks’ dynamic, hard-hitting sound made watching action movies a particular treat. No matter what I played, the speakers always seemed to beg for more, as if to say, “Go for it -- we can take it.” In chapter 21 of Transformers, a battle between Optimus Prime and Megatron, the Polks’ dynamic nature paid dividends: explosions had smooth yet taut bass from the DSW Pro 400, and ample detail and texture from the RTi A1s and CSi A4. Each time a piece of concrete, stone, or glass was smashed to bits, The RTi A1s did a terrific job of providing the impending crack on impact, and also of resolving the intricate sounds of the stone or glass crumbling, and the pieces hitting the ground. The RTi A1s and CSi A4 also presented transients with momentum and precision. In chapter 8 of Daredevil, when the Daredevil is brawling with a criminal in a grungy pub, the camera floats through the air as various sounds are highlighted on the soundtrack -- background music, overlapping voices, bullet casings hitting the floor -- even as a consistent sound picture is retained of what’s happening front and center. All of these sounds started and stopped very quickly, yet all were presented clearly enough to be understood -- a perfect example of just how well the Polk speakers could work together to create a holistic theater experience. The DSW Pro 400 didn’t offer the lowest octaves or highest volume levels that I was hoping for. This was no doubt partially due to my slightly large room; most people with a room my size would probably choose Polk’s larger, more powerful DSW Pro 500 or even the DSW Pro 600. What the DSW Pro 400 did deliver was a bulletproof confidence toward movies and music, yielding smooth, controlled, punchy bass while seamlessly integrating its sound into that of the rest of the system. In fact, when listening to two-channel material, I found the DSW Pro 400 quite musical, especially with jazz and blues. “Cold Cold Heart,” from Nora Jones’s Come Away with Me (CD, Capitol 5 32088 2), was quite enjoyable through the RTis plus DSW Pro 400. Voices were vivid yet smooth, sounding slightly forward. Bass-guitar plucks had a lingering finish that added a nice richness to the music, and piano notes seemed to hang in the air longer than I’d expected them to. Polk Audio has built another quality product at an affordable price. The RTi A1s not only looked brilliant in their real-wood veneer, they offered plenty of detail, control, and excellent dynamics, which all came together to reproduce multichannel source signals with an invitingly three-dimensional soundstage. The CSi A4 further upped the ante with a sound almost entirely free of coloration, clear and articulate and devoid of any dreaded boxiness. Rounding out the system was the DSW Pro 400, which, when used in a room of appropriate size, proved to be a good, easy-to-use subwoofer that excelled with music and movies alike. Put it all together and you have a true winner that deserves to be auditioned by anyone looking for a killer entry-level home-theater speaker system. Warranty: Five years parts and labor (subwoofer amplifier: three years).